A Little Something I’ve Been Working On..
jan 9 quilt collage chartreuse and linen hst quilt, a photo by wandering spirit designs on Flickr. 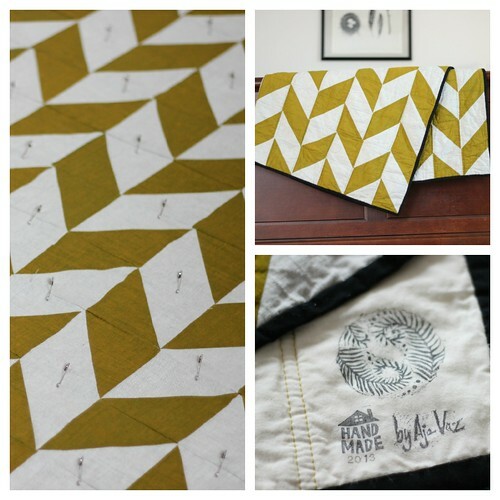 This is a half-square triangle quilt done in a herringbone pattern in Chartreuse shot cotton and natural mix linen. It’s a wonderfully graphic look that blends with traditional or modern. When my in-laws were here over Thanksgiving they weren’t too sure about the color combo- but something told me this would look wonderful all done up- hopefully my cousin and his new wife love it as much as I do since this is a much belated wedding gift for them. Unfortunately, the quilt hasn’t been shipped yet because the hand-carved stamps were impossible to find until today and was finally able to mark the backing. What a lovely gift, they will treasure it for many years ahead, I'm sure! Love the “hand-mad” stamp on the back, gorgeous.